Not sure if you are into what is referred to as classic gentlemen style and its intricacies, but if you like a well-fitted great looking suit, getting it tailored at Savile Row is not the worst address – one that comes inextrivably linked with the connotation of poise, savoir vivre, wordliness and elegance. James Sherwood’s coffetable book on the commandpost of fine high fashion is richly illustrated with material sources from archives along with specifically orchestrated photos and fashion shootings, along with the history of Savile Row’s tailors. It not only lists the facts in terms of detailing what goes into the creation of a fine suit and the considerations that are part of the process from sourcing and choosing the fabrics and serves as a guide and resource on how to get your own gear made, but it also dishes up a bit of gossip and inside information and sheds light on some of the larger than life personalities that inhabited and frequented the exclusive street. 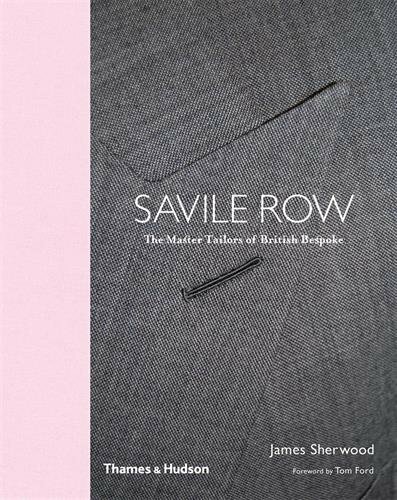 It is those skilled tailors that not only give Savile Row its prestige but also make the book as their stories, view on things, the relationship with their renowned and notorious clientele as well as their vision go far beyond the surface and what could be dismissed as a mundane concern with outward appearance. Being able to chronologically follow the development and different incarnations of the suit as we know it as well as its individual components and seeing how and why it has arrived in what we wear today is an interesting feature that should be interesting not only for the initiated. Anyone remotely interested in quality, handmade, crafted goods should find this book interesting as it is a celebration of an art that had inspired generations in range of disciplines, which is why it is not further wondrous that the foreword was penned by Tom Ford.